Panel Track Blinds | ProMark Window Film & Blinds Inc. The sliding fabric panels of Panel Track Blinds are perfect for larger windows and sliding doors. The view from your picture or bay window can still be enjoyed with the panel tracks are partially closed. Asian-inspired panel track blinds are an elegant way to dress up large windows, patio and garden doors, and can even be used as a room divider. They add privacy and elegance to any room. There are a variety of panel designs and patterns to complement the decor of your room. Design possibilities are endless. 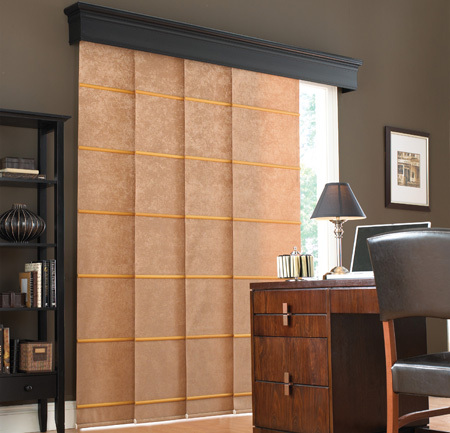 Most fabrics in the panel track collection can also be used on a roller shade, allowing you to coordinate the look of your room. Panel tracks are operated with a cord drive mechanism on a premium quality aluminium tracking system.